Tomb Raider 360 Review. Tomb Raider is a brilliant game on the XBox 360 and the developers have successfully rebooted the franchise for the 21st century with next-generation graphics and gameplay. Move over Nathan Drake... Lara is back to take the crown! One of the most anticipated games of 2013 has finally arrived... Tomb Raider. Unlike the previous games in the series, the franchise has been rebooted which now stars a young Lara Croft (Camilla Luddington) who is just out of University and is beginning her career as an archaeologist. From the moment Tomb Raider boots on the XBox 360, it's like you are watching a Hollywood blockbuster as the game starts with a bang. The story begins with an amazing CGI cinematic that has Lara fighting for her life as the Endurance, the ship that she is travelling on crashes during a violent storm in the Dragon's Triangle. As Lara is trapped on one of the decks and on the verge of drowning, she is rescued by a colleague and eventually awakes on the beach. As Lara is separated from her colleagues, she is violently abducted by a stranger as she finds herself in another dire predicament. 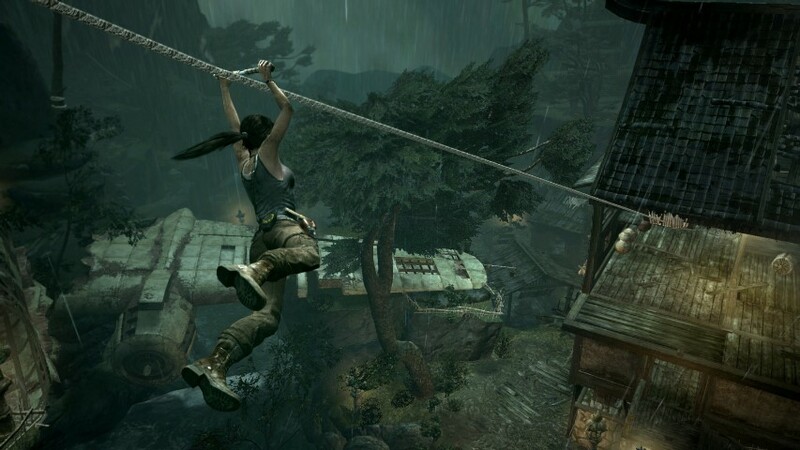 Bound and hanging upside down, the game eventually gives control of Lara to the player as the first level serves as a tutorial which requires you to guide her to safety. Although Tomb Raider was the game that started the action/adventure genre, the current incarnation does have some parallels with Sony's Uncharted Series with not just the gameplay but also the characters. The game also feels like an Indiana Jones movie! Apart from exploring the island, attacking enemies and solving puzzles, Tomb Raider contains some great quick-time events which really enhance the excitement of the title. And just like Uncharted, the characters that Lara encounters are all realistically written with some great voice acting to match. However where the game differs from Uncharted is the experience system and the ability to hunt and craft your own items to further Lara through the game. 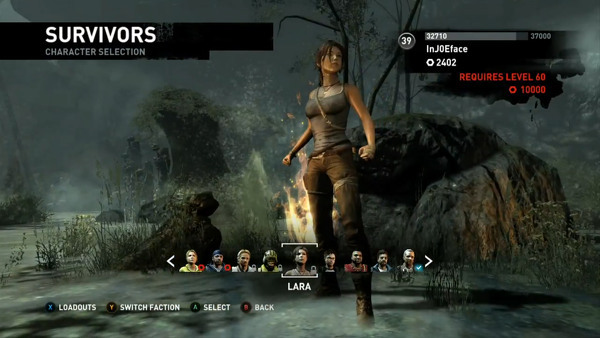 Item/weapon upgrades play a large role in the game as does the experience system which allows Lara to unlock new skills and assists in crafting her destiny. For example in Hunter Upgrades, Lara can upgrade her ammo capacity or become a bow expert. Whereas in Survivor Upgrades, Lara has the ability to increase her animal instinct or cartographer skills. This mix and match formula does allow the player to start the game again and try another path. Upgrading Lara's skills can only be done at a base camp and the I must admit that the auto-save feature of the game is perfect. 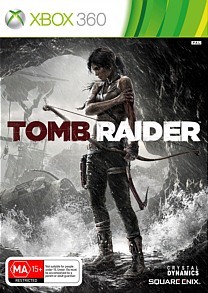 With that said, the game at times is reminiscent of Far Cry 3, however the gameplay is considerably different and whereas the aforementioned game played out like a first person shooter, Tomb Raider is strictly a third person experience with different controls, challenges and puzzles to match. So why is Lara on this "uncharted" island? Lara is joined by Dr. Whitman and team in order to find the Japanese myth of Queen Himoko but fate has other ideas for our heroine which creates a true interactive story. Apart from the main quest in Tomb Raider, there are plenty of side quests and challenges to be discovered along the way in this open-world game, not to mention relics to find. The gameplay of Tomb Raider works surprisingly well on the XBox 360. Given the previous games in the series, Tomb Raider feels more Uncharted than Tomb Raider which is great on so many levels. Whether your precariously climbing up a cliff face, jumping from ledge to ledge or performing some other dangerous platforming manoeuvre, it just feels perfect with the 360 controller. 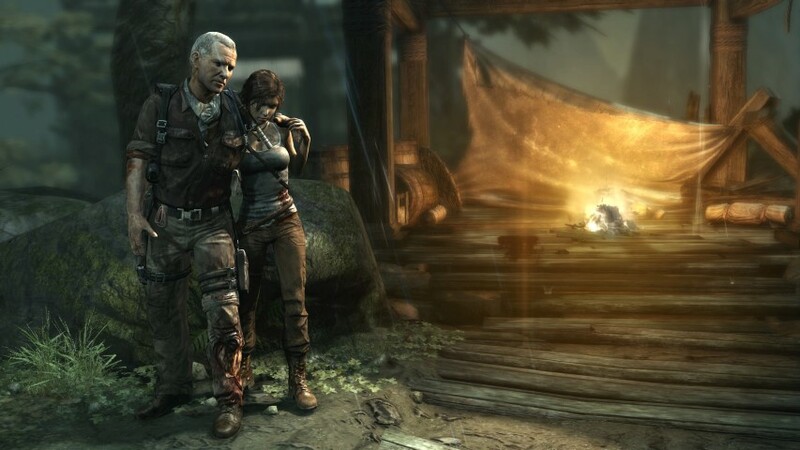 Crystal Dynamics also ensure that you're not thrown into the deep end straight away as the gamer can easily learn the controls without being inundated. Given that, there are three difficulty levels and the highest difficulty level is rather challenging to say the least. Another interesting feature is the "instinct" mode which basically highlights items, objects or directions in the game which assist in pointing you in the right direction. This mode is similar to the detective mode in Arkham City or Raiden's vision in Metal Gear Rising Revengeance. It is definitely a needed feature. The life-like island of Tomb Raider that you explore is quite large and if you explore every nook and cranny, you could easily complete this game in around 15 - 18 hours. Of course, a Tomb Raider game would not be a Tomb Raider game without the ancient temples and there are plenty of places to explore as you encounter enemies, puzzles and deadly traps. As you search for your companions on this dangerous island, Lara soon discovers that this uninhabited island is actually the home to a group of cutthroat mercenaries. This is where the combat kicks in. The first taste of combat are with wolves which is a nod to the original game. Needless to say, using the bow on these fast moving creatures is a little tricky. However when you get the gun, things do start looking up for Lara. In relation to the mercenaries and the controversy about a certain scene in the game, this is a true defining moment of Lara's future and is a very emotional and powerful scene. Wow! As mentioned, the first weapon that Lara masters in the game is the bow which allows you to carefully aim your arrows at both animals and humans. It was actually quite a disturbing scene (another) when Lara first uses her bow on an animal as I missed the head and got its body instead. From there it made this disturbing grunting sound until I finally managed to kill it. Ouch! It's moments like this in Tomb Raider that make this game more than just a game as both the player and Lara must either condone or accept the decisions they make. Without spoiling the story, Tomb Raider is easily the best console experience I've had in a long-time and if you're a fan of this genre, I strongly suggest you check it out. Supporting the single-player game is the multiplayer game and we will flesh this out more once the game is officially released. Tomb Raider actually features an a fun multiplayer mode that split gamers into two teams, survivors and scavengers. These game modes include elements such as Team Deathmatch and Survivor with around five maps that these matches can be played on. What I loved about the multiplayer aspect of Tomb Raider was the ability to set traps and then watching your foes set them off. There's some great loadouts available and characters to unlock as an incentive to play. Using the bow in multiplayer is another highlight but once again, you cannot beat the shotgun for those close calls. Although not as strong as the single-player mode, the multiplayer mode definitely adds another fun element to the world of Tomb Raider. 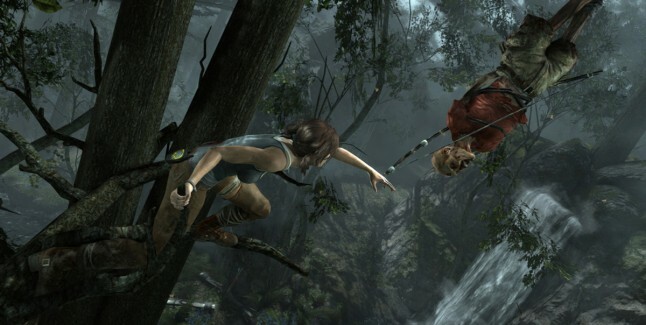 Graphically, Tomb Raider is a visual treat on the XBox 360 with some amazing next-generation graphics. Developers Crystal Dynamics have created this realistic island with some great attention to detail from realistic foliage and lighting. 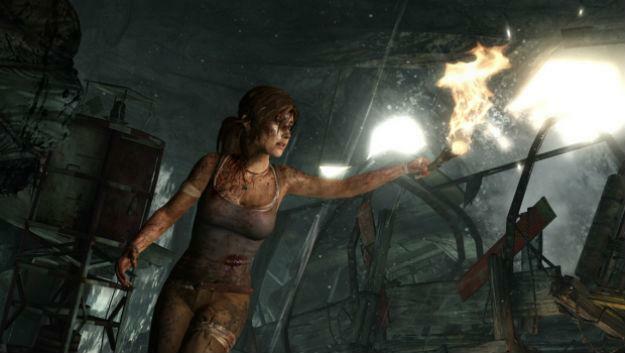 The water and fire effects in Tomb Raider are another highlight of the graphics but the star of course is Lara Croft herself who looks quite uncanny and very life-like. She is easily the most impressive video game character of 2013. Camilla Luddington, below (True Blood, Californication) plays Lara Croft and she really adds this innocence and emotion to her voice. Needless to say, the voice acting of Tomb Raider is extremely professional and when matched with the majestic soundtrack from composer Jason Graves plus the background ambience, it creates this surreal experience on the XBox 360. The game also makes great use of the 5.1 surround sound and when you first shoot your gun, it's almost like being in the same room. Tomb Raider is a brilliant game on the XBox 360 and the developers have successfully rebooted the franchise for the 21st century with next-generation graphics and gameplay. Best of all, the developers pay homage to the original game that started it all but flesh out the character of Lara Croft to create this almost life-like person that you can really relate to. I for one hope that Crystal Dynamics will continue to build other Tomb Raider games with their new Crystal Engine as this game was brilliantly good and extremely fun to play!